No. 23, Jalan Industri USJ 1/3, Taman Perindustrian USJ 1, 47600 Subang Jaya, Selangor, Malaysia. 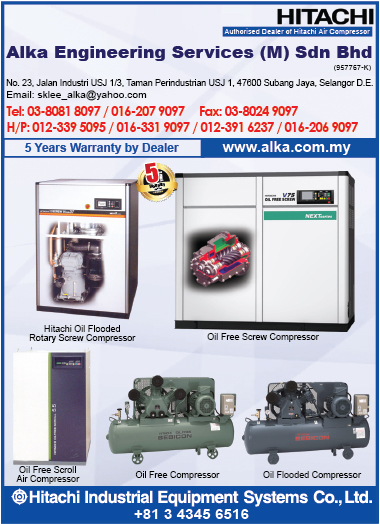 ALKA Engineering Services (M) Sdn. Bhd. was established on February 2007. We offer a variety range of products and services for industrial equipment, as well as for office, laboratory, workshop, hospital, training and educational centre. We are able to provide the right instruments and pragmatic systems base on our extensive experiences in engineering works especially in air compressor. We are committed to creating an environment base on mutual respect, sincerity, fairness and responsibility which each and every one of us can contribute to our success by recognizing their contribution. Our Service Engineer and Back-up team are well trained and experience on the service and overhauling job. They are training in Hitachi, Japan and have obtained training certificate. Our Mission is to integrate various fields of engineering for providing a precise solutions, cost-effective, reliability and efficient services & technical support to our valued customer.